HSH team in attendance at Forskville for the Bowhunters festival were (above, from left) Roger Kingsley, Bradford County Representative; Steve Szoke, Sullivan County Representative; Barb Davis, Sullivan County Food Pantry Director; Larry Rohe, Sullivan County Deer Processor; Holly Mensch, Assistant, Central PA Food Bank Williamsport; Jim O’Brien, Schuylkill County Representative; John Plowman, Executive Director and (not pictured) Mike Serbin, Luzerne County Representative; Dan White, HSH Sponsor and President of the North Mountain Sportsman’s Association. 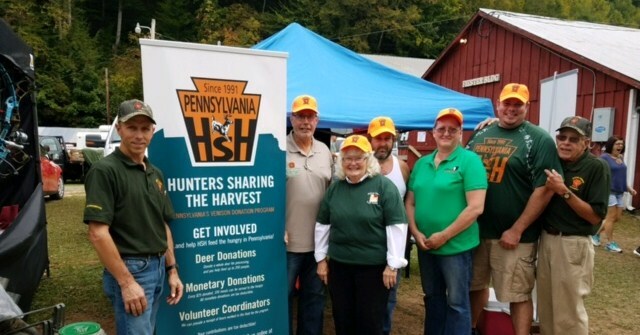 Hunters Sharing the Harvest (HSH), a Harrisburg-based non-profit that facilitates venison donations to food banks throughout the state, had the opportunity to attend the 2017 PA Bowhunters Festival held from September 15 to 17 in Forksville, Sullivan County. The three-day festival featured archery-themed activities to prepare bowhunters for the approaching season. The bowhunting community has made a significant impact on HSH’s mission. Between October and November of last year, HSH processed 12,511 pounds of venison from 336 deer donated by bowhunters in the Adams, Delaware, Cameron, Allegheny, Wayne, Bucks, Luzerne and Bradford counties. The organization’s presence at the festival each year has significantly raised awareness of its mission and the importance of deer donation throughout the state. Individuals representing each step of the Hunters Sharing the Harvest donation and distribution process were represented at the event, from county coordinators and processors, to food pantry staff and sponsors. In addition to raising its organizational profile with hunters and food banks in need, HSH is challenged to find adequate representation and access to qualified processors to serve the entire state. County coordinators are needed for representation of the following counties: Warren, Forest, Venango, Armstrong, Mifflin, Snyder, Northumberland and Columbia. Visit www.sharedeer.org/get-involved/ for more information on volunteering. Meat processors interested in helping HSH meet its increasing supply of venison donations can visit www.sharedeer.org/meat-processors for more information and the registration kit. The deadline to register as a new processor is October 15, 2017. Since 1991, the Hunter’s Sharing the Harvest venison donation program, (HSH) has coordinated the processing and distribution of donated wild game from hunters and municipal herd reduction sources to hungry people throughout Pennsylvania. The HSH program is a registered 501c3 non-profit charity, with funding and support from a mix of public and private sources.